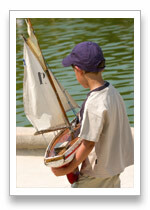 Many Parisians dream of living in the vicinity of the Luxembourg Gardens, a more quiet, greener and somehow more reflective place than its neighbouring areas. Luxembourg is one of the most captivating places in the capital. Its charm is in its old gateways and streets, its bookshops and in the sumptuous yet intimate gardens. Though writers if the eminence as Paul Verlaine and Andr� Gide no longer stroll in its groves, the paths, lawns and avenues are still full of charm, attracting numerous students from the nearby grandes �coles and lyc�es. 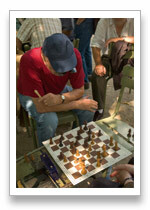 Warm days, old men meet under the chestnut trees to play chess or the traditional game of boules. 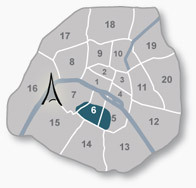 To the west buildings are the public and official, and on the east the houses are shaded by the tall chestnut trees of the Boulevard Saint Germain.